After a tasty breakfast prepared by the captain of eggs, cheese, black beans, and hot sauce wrapped in tortillas, Mary, Karen, Anne, and I go ashore to re-provision at the grocery store. We find nearly everything on our list in a small but well-stocked Bobby’s Market. After buying three bags of ice at another shop, we walk the short distance back to the dinghy dock, passing about ten strutting roosters on the way. Back on the water and out in the channel, seas are the calmest we’ve seen and we put up both sails, hoping to get in some sailing before lunch. Alas, no, there’s just no wind, so after about an hour, we take them down and motor over to Sandy Cay for lunch. We anchor in an absolutely gorgeous spot. The island is tiny, the beaches white, and the surf brilliant blue on black rocks. Palm trees and soaring pelicans complete the picture of an idyllic desert island. The water is every shade of blue, ending in vibrant turquoise close to shore. The sea and the wind are calm, so we decide to try lighting the grill for lunch. After a series of unsuccessful attempts, its clearly the charcoal just won’t light. Luckily, we have a stash that’s drier. Rick and Jenny cool off with a dip in the ocean off the back of the boat while I grill our hot dog feast. We eat lunch, drinking Red Stripes and marveling at the view, so gorgeous and picture perfect, it’s hard to believe it’s real. After lunch, we all go ashore, some of us to explore, others to swim and sit on the beach. I want to take some photographs, so I zip up my camera in double Ziploc bags for the short dinghy ride to the beach. Up close, the tiny island loses some of its lushness, looking scrubbier with only the occasional palm tree, but the view from this vantage is just as nice. I shoot many photos of our boat anchored just off shore, as well as the beach, surf and the birds as Rick, Mary, Karen, and I walk around to the other side of the cay. We come across a colony of pelicans, some skimming the surface of the breaking waves, some fishing, and others drying off and grooming on the rocks above the surf. After about an hour, we turn back when it looks like there might be a change in the weather coming our way. We alter our plans to overnight at Little Jost van Dyke island, instead cruising toward a stop from last year’s trip, Little Harbour on the big brother island of Jost Van Dyke. Very few boats are there, so we take our pick of mooring balls and quickly set up camp. It’s quiet here. Just the occasional bray from a small herd of goats on the nearby hillside. The view is very pleasant and we all relax in the usual afternoon way—napping and reading—as one-by-one the crew takes showers and prepares for the rigors of cocktail hour. Sipping gin and tonics, we watch the sunset reflect off the tall clouds traveling east to west down the channel between us and Tortola. For the next hour, we’re completely entertained by cloud formations and soaring magnificent frigate birds. After sunset, before darkness descends completely, we dinghy over to Sidney’s Peace and Love, a favorite restaurant from our last trip, where we once again enjoy a fantastic meal of fresh lobster. We remember the drill from before and a few of us jump into action, acting as bartenders for the group at the “do it yourself” bar. Dinner at Sidney’s takes a while—it’s made to order on “island time”—but the view, as the lights come up in the quiet harbor, and the company keeps us entertained. Up with the sun to close the hatches during a brief rain shower. Snoozed a bit more until Captain Rick appeared around 6:30 to light the stove and fire up the coffee. The regular morning ritual begins, as folks get up one-by-one and greet the day, stumbling deckside with coffee cup in hand to have breakfast with the island view bobbing around us. At the Marina Cay dock we replenish our water supply, having already drained one of the water tanks. Then, we head out and make our way through the passage between Little and Great Camanoe Islands and over to cruise along the north side of Tortola. A beautiful day of motor-sailing begins with a brief cruise down to Monkey Point on Guana Island, where we drop anchor for lunch. Just a handful of boats are there. On the other side of the point you can see the cave in Monkey Point, snorkelers bobbing around in the protected area near the rocks. After ten minutes of futility, we give up on starting the grill—the one consistent difficulty on the trip. Everything needed to start the fire—the matches, scraps of paper and even the Match Light charcoal—seems damp. Hopeless. Mary cooks our hot dog lunch on the stove and we enjoy our meal with a new view. Before picking up anchor and continuing on our way to Cane Garden Bay, we decide to take a little sightseeing tour over to the cave on Monkey Point. It’s here that we perform our most bone-headed move. Only after we’ve all climbed into the dinghy and let go of the rope to the Sunnyside do we realize the dinghy’s outboard motor doesn’t have nearly the horsepower it needs to transport one, let alone six passengers. We slowly begin to drift away from the boat and out to sea while Anne madly tries to throttle the boat forward. Luckily we’re able to get enough forward momentum (against the wind, no less) to putt-putt us back to the stern of our boat. We grab on and quickly hop out of the dinghy laughing. Whew, a close call. Lesson learned: Have a couple of people test the dinghy motor in a protected area before you all climb in and drift away. Up anchor and we’re off. 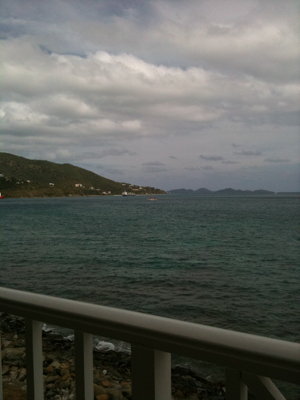 We pop up the jib, turn off the motor, and enjoy the view of Tortola’s north side as we float past. The green hillsides, rocky shore and blue crashing water make for a tranquil afternoon sail. The seas are calmer today, rolling along in our direction. As we approach Cane Garden Bay, all eyes strain to see the red channel marker that points the way to safe entry into the bay…only, it’s nowhere to be seen! We creep into the bay, careful to avoid the reef on the right. Cane Garden Bay is already crowded, most cans taken by boats participating in a regatta. After one failed attempt to pick up a buoy (our first) we snag one closer to shore, hoping for less rock and roll during the night. A leisurely afternoon spent napping and reading as the boat sways back and forth, giving us multiple views of the island. We make a call to Sunsail to have someone look at the dinghy motor and a few hours later, a mechanic shows up and swaps out the dud. We motor to the dinghy dock on shore, tie up and walk a short distance to find a great spot for dinner, The Big Banana located right on the beach. We enjoy the sunset over the bay as we toast two-for-one painkillers (the BVI’s signature rum drink) and a delicious dinner of fresh fish, pasta, and barbecue. Two for one, pain killers all around. We motor back to the boat in the dark, headlamps lighting our way between boats in the harbour. The lit up masts of the race boats provide an interesting new backdrop, like bobbing antenna towers. A few hours of chatting over a bottle of wine and stargazing before we all turn in around ten. Sunset over Cane Garden Bay. Up early. Lots of bobbing and bouncing during the night. The wind doesn’t seem to have abated much. The skies are more sun than clouds. Tall, white puffy clouds float along from east to west. The island goats are out for an early breakfast as are the ever-present pelicans. We enjoy a breakfast of bananas, bagels, oatmeal, and coffee as the sun lifts in the sky, warming the wind. Sunlight illuminates the turquoise blue of the water around the island. We clean the kitchen, stow gear, and check the radio for the weather report. Conditions for the next two days call for a small craft advisory with winds 12-15 knots and seas seven feet high; not ideal for the amount of sailing (meaning the distance) that we want to accomplish for the day. About 8:30 a.m., we drop our mooring and head into the Drake Channel for what will prove to be a wild ride to Marina Cay. Conditions call for us to change our plans—a sail all the way to the North Sound of Virgin Gorda would take too long and be far too bouncy for some of us with weaker stomachs. As it is, the sail to Marina Cay (about half our original intended distance) takes four hours of sailing as close to the wind as we can, tacking our way back and forth and back and forth and back and forth. We raise only the jib and that’s plenty of sail for us. Wind gusts top out at 22-24 knots (around 28 mph) and the waves are seven-feet at times. Most boats we see under sail are doing the same and many aren’t sailing at all, opting to motor their way along. Lots of up and down over breaking waves and everyone is covered in sea spray. An occasional slap in the face with a wave brings laughter and applause from the crew. Jen is soaked sitting in her favorite perch up on the bow, getting the most out of the ride. Four hours later (my mind-over-stomach limit) we enter calmer waters as we round Beef Island and come into Marina Cay to the mooring field next alongside Mother Turtle Reef. We’ve returned to one of my favorite spots in the BVIs. Once again, we’ve got a fantastic view of Beef Island across the water, the face of the island constantly changing as sunlight and clouds play over the green mountain and the variations in blue of the reef. The calming sound of waves breaking over the reef provides a soothing background soundtrack. After a recovery lunch snacking on cheese, salami and veggies, everyone crashes for a nap or relaxes on deck to enjoy the view or read. The wind finally calms a bit and we stop the rocking and swaying for the first time in many hours. Around 4:30, cocktails are served and Captain Rick begins preparations for dinner. After a good 20 minutes, we finally manage to light the coals. It takes three of us, two to block the strong winds with a towel. Our dinner of grilled chicken, rice and corn on the cob is delicious and the hungry crew devours it in no time. It’s amazing how being out doors and in the elements all day can bring on a hearty appetite. We break out another bottle of wine, chatting as the setting sun illuminates the tall cumulous clouds and small puff balls in the west turning them vivid shades of pink, orange and purple. By 7:30, it’s pitch black out and the sky once again is filled with stars. The crew turns in by nine. Not the most restful night on board, everyone is up early with the sun. We shower on shore at the Sunsail marina facilities and grab snorkel and fins on our way back to the boat. At 8:30 a.m., a Sunsail employee named Julian arrives to give us our boat briefing. There are far fewer questions this go around, since this is our second charter and we’re already familiar with many of the basics. The briefing works as a good refresher and when Julian’s done, a mechanic arrives to repair a leak in the propane tank, discovered during our walk through. At 9:30, our captain (Rick) and the first mate (Jenny) head over to the Captain’s Meeting, a briefing of weather, news, location info, do’s and dont’s given by Sunsail before each fleet of new charters sail out for the day. Meanwhile, our delivery of provisions from the local supermarket arrives and Anne, Mary, Karen, and I take care of counting, loading and stowing everything away. The order was placed online a week earlier and constitutes the majority of food, drink and supplies we’ll need on board for the week. A couple of stops at the grocery stores in ports along the way are planned as needed. After a quick lunch, we get underway, heading out into the Sir Francis Drake Channel. Winds are quite strong and the seas are unusually full of large swells, so we abandon our plan to stop at the Indians and head directly for our first overnight spot, Peter Island. With gusts around 24 knots, we don’t raise the sail—the ride is eventful enough as it is. A quick spin around our intended overnight spot, Little Harbour, reveals that, due to the weather, all the anchored boats have tethered their sterns to the shore to keep from swinging around. Rather than challenge ourselves on the first day at sea with a new maneuver we’ve only read about, we head over to Great Harbour and pick up a mooring ball near the beach. There are about 18 boats spread out in the harbor. It’s quiet, except for the wind and we’re immediately entertained by the pelicans soaring, circling and diving into the ocean. Red Stripes (our official Caribbean boat beer) all around. We’ve arrived! A relaxing afternoon is spent chatting and enjoying the view as the boat swings this way and that. Karen and I have the first dinner crew so we get to work in the galley chopping up veggies for our fajita dinner. Lighting the grill that hangs off the back of the boat is always a challenge in the win;d Karen and Jenny provide a screen with a towel until the coals get going. We grill up the veggies and flank steak and dinner is served topside, as are all meals throughout the week. We eat early, having learned last year that the sun sets early on the equator and it’s no fun grilling dinner in the dark on a boat. After dinner, we spend a few hours chatting, drinking wine, and enjoying the view. Before we turn in, the clouds clear, revealing a mass of stars overhead. We can make out the constellations canis minor, orion and vela. The dead of winter seems like a good time to play catch-up and post the travel notes and photos from my sailing vacation in the BVIs last April. So, here goes. Up early and off to the airport. An uneventful, easy flight, the entire crew of six flying down together. The hour layover in San Juan, Puerto Rico gives us enough time to have a snack at the bar before our 40 minute island-hopping flight over to the British Virgin Islands. Touchdown, Beef Island. After the taxi ride to the marina, we’re instantly escorted to our boat, a “43” called Sunnyside. Everyone aboard, scrambling over the deck and loading bags down below. A quick check reveals the loss of four feet (from last year’s boat) doesn’t much effect the space in the main cabin, though storage is at more of a premium. Back at the boat, it’s not long before we all turn in. It’s been a long day of travel and we’ll be up early tomorrow for the boat briefing and provisioning. For some unknown reason, the book and calendar projects that I had in my iPhoto program (created last December) have disappeared. A slight amount of panic was followed by a sick feeling as I discovered that the Time Machine backup program has not backed up iPhoto as I thought it was. This means the books I created about JD for her 3rd birthday are gone gone gone and I'm p-i-s-s-e-d. Folks wanted to order copies of them and now what little $$$ I would have made off this labor of love will be completely eaten up by my having to recreate these projects. Like I have time for this now. And after all that, it still doesn't explain how they went missing in the first place. I'm just sick about it. If my attempt to retrieve them from the cloud doesn't work, I'll make a last ditch call to Apple to find out if they can be of any help. But I'm not holding my breath. And none of this is what I intended to blog about in the first place. I meant to say hello, I'm back, safe and sound from our sailing adventure. We had a fantastic time challenged by stronger-than-usual winds and lots of waves. The weather altered our itinerary a bit but the nice thing about sailing down there is you can be flexible and find another beautiful spot to drop anchor no matter where the wind takes you. I took about 800 photos that I'll get to in who knows when and I shot a lot more video than last time, so that will be fun to play with in the coming months. All in all, it was a relaxing and wonderful time, filled with wind, sun, the call of laughing gulls, the splash of pelicans diving for fish, the gentle (and not so gentle) roll of the tide, and gorgeous sunsets painting tall clouds as they floated by from east to west over the ocean. These are images that will carry me through the coming weeks and months.